Perfect Fit Adult Rich in Chicken is a unique and delicious dry cat food. Providing 100% complete, balanced nutrition and all-round health protection. 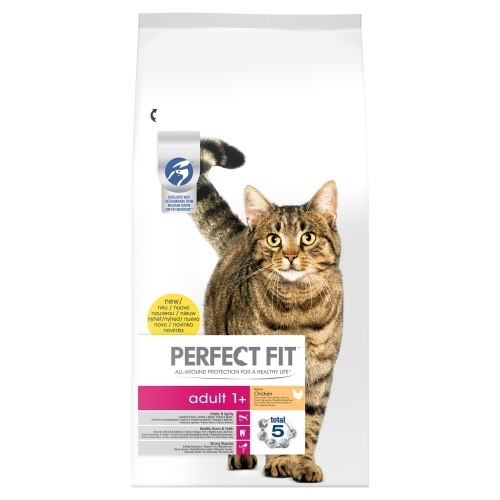 Containing a ‘Total 5’ formula, it provides 5 benefits addressing the most common health needs of all cats: digestion, urinary tract, natural defences, skin & coat, optimum weight management & body condition. •	Provides all-around health protection. •	Rich in high quality protein, supporting the development of strong muscles. •	Increased vitamin B & iron levels to maintain your cats agility. •	Balanced minerals to support Lower Urinary Tract health. •	Contains taurine, vitamin E, vitamin C and anti-oxidants to support natural defences. •	Contains a source of omega-6 fatty acids, to help support a healthy skin and coat. •	Combination of L-carnitine, increased levels of protein and energy promote optimum weight management and body condition. Protein 41%, Fat content: 14.5%, Inorganic matter 8.5%, Crude fibres 2.5%, Calcium 0.98%, Phosphorus 0.98%.